I have become less and less enchanted with Peter Jackson's prequel trilogy the more and more we get of it. Thankfully, The Battle of the Five Armies will be our last trip to Middle Earth (if at least for some time) for the more Jackson and company string out their financially successful series the more he seems to discredit the genuinely engaging and handsomely made films that started it all. There was always great hope for an adaptation of The Hobbit given it would return Jackson to a place he clearly has a passion for, but a lack of care also seems to be the source of trouble with each new chapter in this prequel trilogy. It feels as if each movie hinges on one or two major set pieces allowing it to deliver what audiences expect while the remaining hour and a half is left to be filled with subplots that are either unnecessary to the main narrative or feel forced in so as to simply extend the running time. Is it required a film must be two and a half hours for it to feel epic? Peter Jackson seems to think so, but as Battle of the Five Armies comes in at two hours and twenty-four minutes it is by far the shortest installment and at the very least, feels like much of a relief because of it. I didn't like a lot about this final chapter. I wasn't impressed with the structure of the story or the organization of the titular five armies (if you haven't read the book you'll be left wondering who exactly the fifth army even is) and more than anything it was frustrating to see a maguffin as obvious as "Dragon Sickness" pit Thorin Oakenshield (Richard Armitage) against seemingly everyone else in the entire movie, even his fellow dwarves. Certainly, some of the blame for this can be placed on all of the rules, worlds and ridiculous names that author J.R.R. Tolkien originally came up with, but with as much of a beast as Jackson has turned this small, three hundred page introductory novel into I'm willing to place most of the blame on he and the studio for compromising much of the stories merit for greed. I understand the reasoning, I realize there is a business aspect to it all and that by splitting the planned two films into three allows this third films box office to generate pure profit, but that doesn't mean I sympathize with the decision because while they get extra cash on their Christmas bonus, audiences everywhere are short-changed by this insufficiently justified chapter. 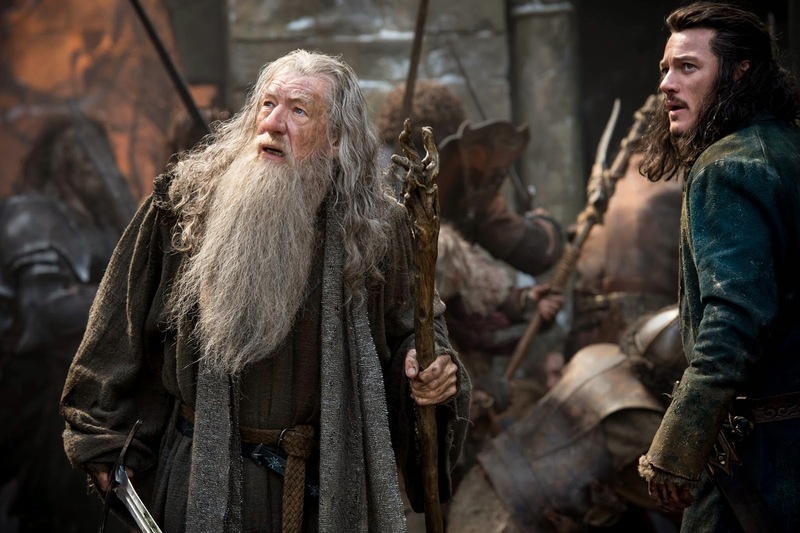 Gandalf (Ian McKellen) and Bard (Luke Evans) face insurmountable odds. To his credit, there isn't as much messing around in this closing installment as Jackson jumps right back into things picking up where The Desolation of Smaug abruptly left off. We are dropped back into the quaint Lake-town that resides at the bottom of the mountain that houses the dragon Smaug. Bard (Luke Evans) fights for his small piece of Middle Earth as much of the town flees from the dragon that is quickly turning it to ashes. Thorin and his company of dwarves meanwhile have reclaimed their homeland and are hard at work searching for his family heirloom, the arkenstone of Tharin. Before the title card even comes up Bard has killed the dragon Smaug and has somewhat reluctantly moved into a position of leadership. He leads his people up through the mountains some abandoned ruins where they will presumably receive aid from the dwarves. The aforementioned "Dragon Sickness" comes into play here as Thorin has become obsessed with reclaiming his treasure above all else. It is not he who comes to the aid of man, but instead it is the elf army under the command of Thranduil (Lee Pace). When the elf army arrives, Thranduil forges an alliance with Bard in hopes of claiming a necklace of white gems from Thorin's treasure. Bard attempts to reason with Thorin to avoid war, but Thorin, much to the dismay of his company and Bilbo (Martin Freeman), refuses to share any of his treasure or help those in need in any fashion. As all of this is going on there is also the incoming threat of an orc army led by Azog (Manu Bennett) who, after learning of the elf army, sends word to Gundabad to summon their remaining forces. Legolas (Orlando Bloom) and Tauriel (Evangeline Lilly) are also in on the action as they witness the march of this second massive Orc army and rush back to warn the others of the impending second wave of attacks. While all of this is going on there is also Gandalf (Ian McKellen) to keep in mind as he is stuck in a cage at the top of another mountain and is rescued by the likes of Galadriel (Cate Blanchett), Elrond (Hugo Weaving) and Saruman (Christopher Lee). It's easy to get lost among all of the details, but we really know it's all just an excuse to get the dwarves, elves and men to unite or be destroyed. My real issue with the film though, and this would be a problem with any film not just one as singular to its world and characters as one based on Tolkien literature, is that none of what is going on seems meaningful or substantial in a way that it is worth what will come after the loss. There is a moment late in the film where I sat back and thought to myself what might an orc do if they were to actually win and survive this battle? What is the point of them even fighting? The gold that Smaug guarded? What would riches do for an orc in this age where they seem so animalistic as to be able to live happily off the land? It's as if there is almost no thought or reason to it other than the good guys need someone to fight and they need to look ugly and disgusting enough for us to inherently think of them as evil. I, again, realize this isn't the point of such fantasy films so as to go as far as asking a ridiculous question such as what an orc needs money for, but to even get to that place in my thought process has to say something about the value of the entertainment at hand. I also realize the production that included crafting this final chapter was likely anything but rushed yet I can't help but feel like the majority of what we're seeing here (sans the massive battle sequences) are scenes that would have ended up on the cutting room floor of a much tighter, two-film series. Instead, this third and final chapter in Jackson's second Middle Earth trilogy is patched together by disparate storylines that eventually and awkwardly merge to create what we come to see these movies for in the first place (those massive battle sequences). The emphasis is on the armies, on the fighting and while there are a few actual involving moments along the way that sprinkle in genuine emotion and do there best to move the story forward there still isn't enough for the culmination of these events to mean anything more than a distraction. Based on little more than the massive scope on which these films operate it is hard to look at them as underwhelming, but as our titular hero whose story and journey we are supposed to be taking part in is relegated to little more than a supporting character it is also hard to see this final film as anything close to fulfilling much less definitive. 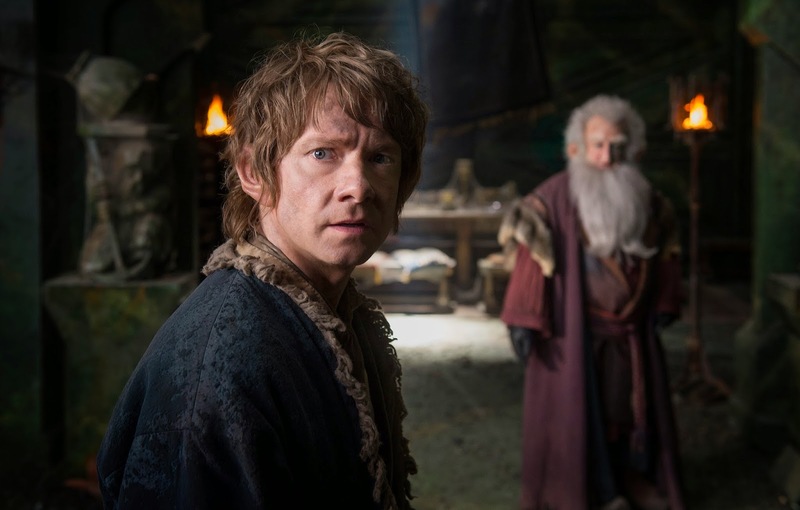 Bilbo Baggins (Martin Freeman) seeks council from Balin (Ken Stott) in The Battle of the Five Armies. I sound as if I hate the film and the truth is I didn't, not really. I'm probably (wrongly) taking my frustration out on The Hobbit series as a whole with this film as we now have a full picture of what things look like. There are certainly things to appreciate here be it a few pieces of striking imagery in the third act or the emotional weight we feel with the Tauriel and Kili (Aiden Turner) storyline that is explored in little depth, but resonates given its universal themes. What is disappointing about this chapter more than anything is the ease with which Jackson has come to use CGI. In the original trilogy there was a natural aesthetic to things, especially the orcs, as well as the environments and despite knowing large battle sequences are largely computer generated there was something about the way it was shot that felt authentic. In this second trilogy and to greater effect than ever before it feels like while watching The Battle of the Five Armies that I was watching a video game. The director has strayed so far from practicality that even when Thorin’s cousin, Dain Ironfoot II (Billy Connolly), shows up he is completely computer animated and for what reason? Why use motion capture when you have a living, breathing actor (and one of Connolly’s skill no less) who is willing to perform the part and cover that with unrealistic renderings? Regardless, it is not just with this character (though he serves as a prime example) but in many instances that one is forced to wonder how much of this they actually shot given the only things that seem real are a handful of the human characters necessary to the throughline plot. 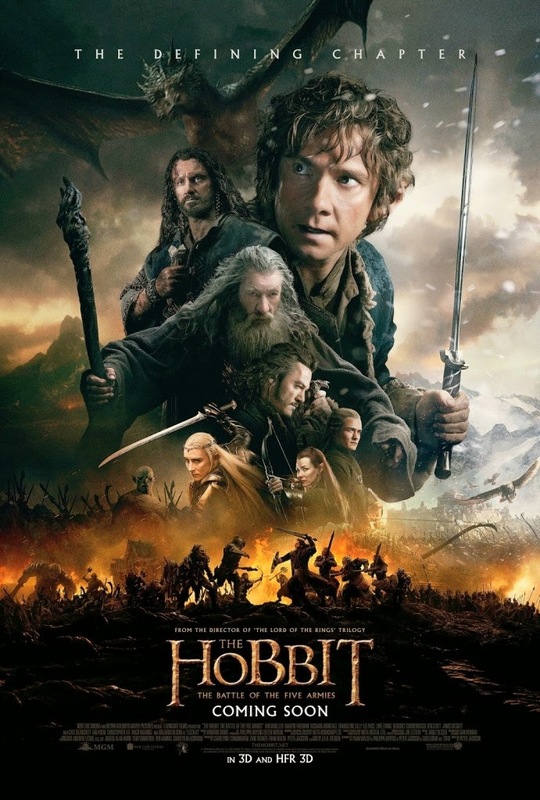 It is with something of a disheartened sigh that this final film closes on more of a whimper than a roar, but despite Freeman still giving a charming and affable performance as Bilbo there is not much to cling to here in terms of what you can dig in deep enough to enjoy. All of the actors and performers are more than up to the task and more specifically Ryan Gage as Alfrid provides some nice comic relief, but more than anything it simply feels as if Jackson has wandered so far from the innovation and vision of what made his original trilogy so enchanting that this film is more the story of a director who's lost himself and his way rather than a hobbit who discovers who he really is.